If you’re planning a trip to Rajasthan, Jaisalmer is one place you cannot miss! Jaisalmer Fort is located in the heart of the Thar Dessert and is known for it’s beautiful yellow sandstone coloured buildings and surroundings. Now while staying in Jaisalmer a Camel Safari was obviously on the top of our list, but this isn’t the only must do we recommend! There are so many options when it comes to Camel Safaris’ it can be hard to know which one to go for. Yet as luck would have it, upon our arrival at the Titanic Hotel, a safari was leaving that day, so on a whim we booked it and it was the best decision we could have made! The safari included two days and one night. During the days we were taken on two hour camel rides through the desert, to and from our campsite, experiencing beautiful sights of the vast desert and bright blue skies. In the evening we were treated to cold beers, authentic Indian food, campfire sing-a-long (My Heart Will Go On was a firm favourite!) and an amazing fire show. Top Tip: Now although through the day the Thar desert is hot hot hot! at night it is cold cold cold, wrapping ourselves in a hoodie, sleeping bag and two blankets we could not quite warm up, so we suggest packing your thermals! Yes you will need thermals in India, who’d have thought! ?However, there is one bonus about being woken up in the middle of the night and that is opening your eyes to a breathtaking clear and starry night sky. Jaisalmer Fort is one of the largest forts in the world and is essentially a fortified city! Standing on top of Trikuta Hill the fort’s walls provide a great viewing platform to see the rest of the city and onto the Thar Desssert. Inside the fort you will find the Jain Temples, markets, hotels and much more. We loved wandering around the temples and markets, even stopping off to have our hands and feet decorated with traditional henna! It is beautiful, mesmerizing place to be! However, the people of Jaisalmer have quite a unique way of selling their bed sheets too… Its a different shopping experience to say the least! The Jain Temples are located in the Jaisalmer Fort and comprise of seven beautifully carved yellow sandstone buildings which are a wonder to explore! All located near to each other you can spend an morning walking from temple to temple taking in the amazing carvings. The temples are the most religious buildings in Jaisalmer and probably the most decorative buildings we’ve seen in India, and that’s including the Taj Mahal and Gaitore! However, be aware of the opening time for tourists as the temples are only open all day to worshippers. 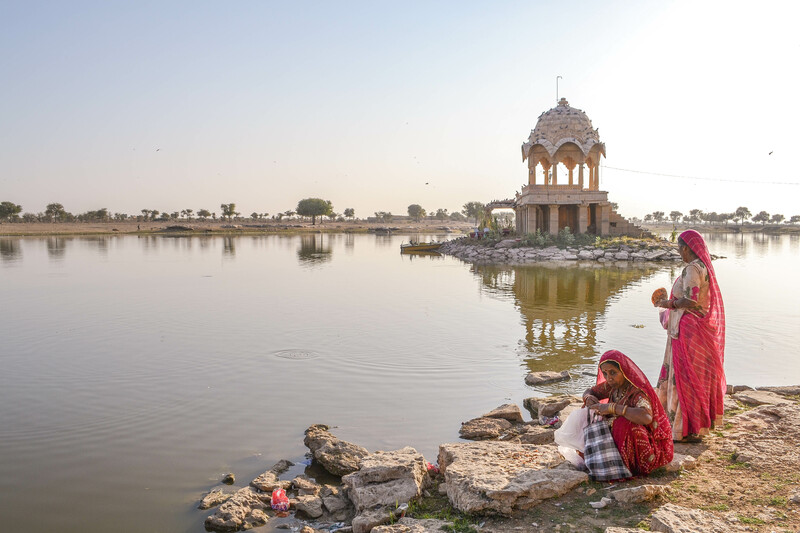 The Gadsisar Sagar Lake is a short walk from Jaisalmer Fort and a welcome break from the hustle and bustle of the markets and crowds. This man made lake was once the only water source for the whole of Jaisalmer, and one of the most popular destinations! It is a beautiful lake surrounded by temples and shrines so plenty to explore! We arrived just before sunset meaning we were able to sit, relax and watch the sun going down, a breathtaking view that cannot be missed! It was also a great time to take some beautiful pictures. Pick up a book and your camera and you could spend a whole day watching the world go by. It may seem strange to include a hotel as a ‘Must Do’ however The Titanic Hotel was hands down the best place we stayed while travelling Rajasthan. Not only due to it amazing Camel Safari but because Polu was such a great host. After a day of exploring the Jain Temples and Gadsisar Sagar Lake we were invited to Polu’s son’s birthday party. He put of an amazing spread of Indian cuisine, beer and traditional music… and then the whisky came out! It was a brilliant evening chatting to our hosts and fellows travellers, definitely one to remember! After Jaisalmer we moved onto our last stop in Rajasthan: Jodphur!